Many startups take their first steps up the ladder in Mumbai. India’s financial capital is now also one of its top three startup destinations. 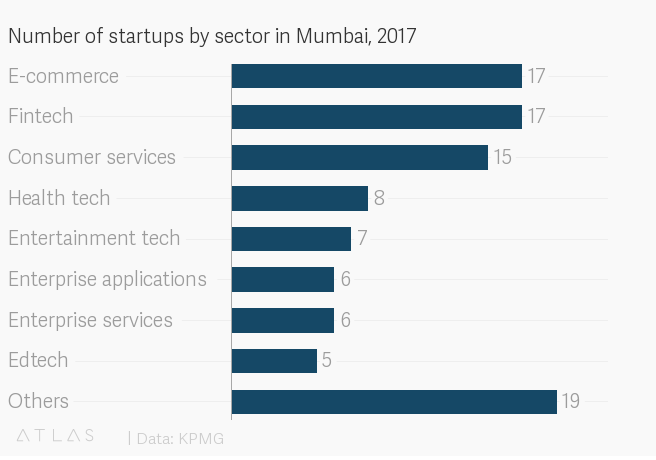 The western city of Mumbai, home to the country’s biggest stock exchanges and some of its largest business conglomerates, was the base for 14% of the nearly 50,000 startups established in India by the end of 2018, according to a KPMG report released on Feb. 01. Mumbai, the capital of Maharashtra state, is third behind India’s Silicon Valley Bengaluru (25% of startups) and capital city New Delhi (21%) in the number of startups hosted. “Proliferation of the internet, higher rates of literacy and greater exposure to the outside world have fuelled sector-based innovation in IT, artificial intelligence, IoT (Internet of Things), finance, healthcare, biotechnology, education, agriculture, and logistics, to name a few,” KPMG’s report said. Though the startup boom is happening all over the country, including in some tier II cities like Kochi and Jaipur, “Mumbai is undeniably the prime growth centre for startups,” the consultancy noted. E-commerce startups comprise the biggest share of budding companies in Mumbai, followed by fintech—an area of focus for Maharashtra. As part of its fintech policy, the Maharashtra government in February 2018 set aside a corpus of Rs200 crore ($28 million) to promote 300 startups over the next three years. It has already made a start by shortlisting 13 Mumbai-based firms, including One Wallet, Huepay, and Monitree, for an accelerator programme. What makes Mumbai an attractive startup hub is its great connectivity with other countries, a growing number of co-working spaces, as well as a massive consumer base. The presence of prominent venture capital firms such as Sequoia Capital and Matrix Partners is also a boon. “Home to a number of experienced industrialists who can mentor and support startups with the right do’s and dont’s, and if need be, fulfil their financial requirements as well, the financial capital of the country is the place to be for budding entrepreneurs,” the report added. The presence of the Indian Institute of Technology Bombay (IIT-B) also provides easy access to tech talent. Additionally, IIT-B has one of the largest startup incubators in India, Society for Innovation and Entrepreneurship (SINE), which has incubation capacity of 15,000 square feet where it can accommodate over 30 companies at a time. Some of the startups in Mumbai have seen massive success in recent years. KPMG said several Mumbai-based startups fall in the “soonicorns” category, which includes soon-to-be unicorns (private startups worth over $1 billion). Some of these startups are online beauty products retailer Nykaa, ticketing firm BookMyShow and fantasy sports platform company Dream11, according to KPMG. The ripple effect of this burgeoning startup energy is extending beyond just the commercial hub. About 150 kilometers out of Mumbai, Pune is also emerging as a promising startup destination in Maharashtra. Factors that work in Pune’s favour is its real estate, which is far more affordable than Mumbai, and its climate that is generally less hot and humid. Pune has been a hub for traditional IT for several years now and has huge offices of outsourcing majors such as Infosys, Cognizant, and Tata Consultancy Services. 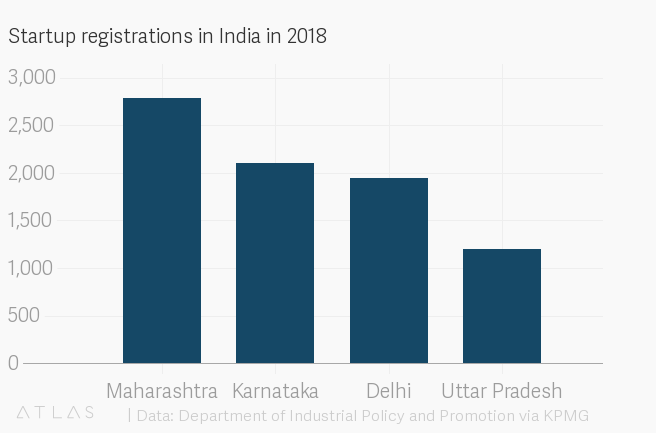 In mid-2018, the city laced with multiple college campuses offered the most tech job openings in India after Bengaluru and Delhi. “In addition, the city has a presence of venture capital funds such as Alacrity, while TiE Pune which is active in the city has assisted over 800 startups in the past six years through its “nurture programme”,” KPMG said. Between January 2014 and September 2018, startups in Mumbai and Pune together raised a total of Rs37,700crore—13.5% of the total Rs2.7 lakh crore raised in India during the period, KPMG said. Several other smaller cities in Maharashtra are also catching the fancy of startups. The state government is pulling a string of non-metro cities like Aurangabad, Nagpur, Sholapur, and Nashik into the fray with “progressive policy and regulatory environment,” according to KPMG. Through initiatives like Maharashtra State Innovation and Startup Policy 2018, authorities have committed to disbursing Rs50 billion(Rs5,000 crore) by 2022 to build 10,000 startups and generate 5,00,000 direct and indirect jobs in the western state. Nashik has witnessed growth in healthcare firms, while Nagpur is turning out to be an ideal location for renewable energy. Now, of the 14,565-odd startups approved under the Startup India programme in 2018, the maximum are from Maharashtra.